A visa is not a passport: a passport allows you to travel beyond your home country's border and serves as a form of identity, a visa is a legal document that allows you into a particular countries. If you are from Australia, North America, Europe and some other countries, you can travel to many places without a visa, but Vietnam is not the case. The answer depends on the passport you are holding. 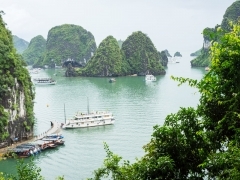 Some nationalities are granted entry to Vietnam for a month or less without a visa - the rest must possess a written permit of some form to board the plane and enter the country. Service fee: (upon request) - FREE of Charge We offer Free visa approval letter for customers who book a tour or overnight cruise with us. Stamping fee: 25 USD - Payable directly in cash at the airport when you arrive in Vietnam. After receiving your request for a Vietnam visa, we will arrange a pre-approval letter so you can pick up your Vietnam visa on arrival at an International airport in Vietnam. The processing time is 3-5 working days. When you arrive at the airport, present your passport, the pre-approved letter, 25 USD for stamping fee and two (2) passport photos (4cm x 6cm) to obtain the visa stamp.